70% of the Jewish population voting for Obama may show a grave disconnect between Israel and the Jewish population abroad. Is there a disconnect among world Jewry? As election results have been confirmed and statistics from national polls emerge, showing that American Jews overwhelmingly supported Barack Obama - with 70% of the Jewish population voting for Obama - questions emerge about the the true sentiments of this population towards Israel and the possible disconnect between Jews in Israel and those abroad. David Bedein, founder of the Israel Resource News Agency and Director of the Center for Near East Policy Research finds the disconnect between the religious in Israel and the U.S. particularly startling, saying many Republican supporters were shocked by the refusal of Orthodox leaders to throw their support behind the pro-Israel Mitt Romney. "Those who think that Orthodox Jews supported Romney and secular Jews supported Obama are wrong. This is simply not true," said Bedein. "In New Jersey they established the organization 'Rabbis for Romney,' and they turned to all sectors of Orthodox Jews, and there are a million Jews like that, but their rabbis refused to join." 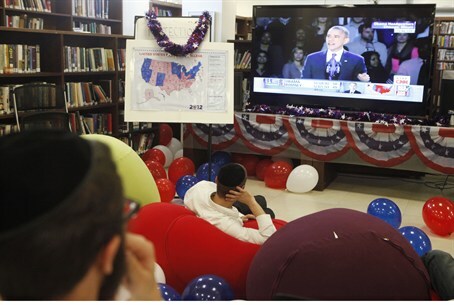 In his opinion, Jewish support for Obama indicates a grave detachment from the land of Israel. Rabbi Ben Rosenberg, who established Rabbis for Romney, said to me: "We approached the Young Israel organization, which represents hundreds of synagogues, we approached the Council of Rabbis in the U.S., the Chabad organization, Agudath Israel, all of them refused - they told us they wanted to protect their ties to the current government. We need to understand that the difference (in votes for) Obama and Romney was very slight in the key states, and if those rabbis and leaders would have done something, if they would have emphasized how dangerous Obama is for Israel, it would have changed the entire picture and Romney would have been put in the White House." Bedein believes that Orthodox Jews who put on tefillin and pray three times a day but voted for Obama, pose contradictory questions based on their behavior. "He is the President who did terrible things, who appointed anti-Semites, who supported Islam and here there are Jews who pray three times a day, who learn daf yomi (Talmud page), who have close relatives in Israel and they vote for Obama. All this should inspire us to think about the relationship between the religious in Israel and the religious there and why there is such a disconnect."